The N2 is a national route in South Africa that runs from Cape Town through Port Elizabeth, East London and Durban to Ermelo. It is the main highway along the Indian Ocean coast of the country. Its total distance of 2,255 kilometres (1,401 mi) makes it the longest numbered route in South Africa. 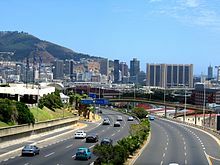 The N2, which is also known at this point as the Eastern Boulevard (now Nelson Mandela Boulevard), as it enters the City Bowl of Cape Town. The N2 begins in central Cape Town at the northern end of Buitengracht Street outside the entrance to the Victoria & Alfred Waterfront. The first section of the N2 is shared with the beginning of the N1; it is a four-lane elevated freeway that runs along a strip of land between the city centre and the Port of Cape Town. On the eastern edge of the city centre the two roads split, and the N2 turns south as Nelson Mandela Boulevard, crossing above the yards and approach tracks of Cape Town railway station. After Hospital Bend the N2 turns east to travel across the Cape Flats as a 6-lane freeway to Somerset West; this section is known as Settler's Way. Along this route it crosses the M5, M7 and R300 freeways; it also travels just past the end of the main runway at Cape Town International Airport. In Somerset West it is reduced to an undivided highway, passing through several intersections with traffic lights, which cause frequent congestion. East of Somerset West the N2 climbs Sir Lowry's Pass to enter the Overberg region. It passes near the town of Grabouw on the Hottentots-Holland plateau before descending the Houwhoek Pass to Botrivier. After Botrivier it passes across the agricultural plains through the towns of Caledon, Riviersonderend, Swellendam and Riversdale to re-approach the coast at Mossel Bay, which marks the beginning of the Garden Route. Just west of Mossel Bay the N2 again becomes a divided freeway, and remains one as far as the intersection with the N9 just outside George. From there it travels across Kaaiman's Pass (see below) to Wilderness and on to Knysna and Plettenberg Bay. After Plettenberg Bay a section of the road is tolled as the Tsitsikamma Toll Route, primarily because of the Bloukrans Bridge; an alternative route used to run through Nature's Valley but this is no longer available due to flood damage. 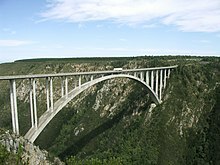 The Bloukrans Bridge marks the border with the Eastern Cape and is the site of the worlds highest bridge bungy, Bloukrans Bridge Bungy. In the Eastern Cape the N2 passes near Humansdorp and Jeffrey's Bay before becoming a four-lane divided freeway through the city of Port Elizabeth, ending at Colchester, Eastern Cape. The N2 continues in a north-easterly direction from Port Elizabeth, moving away from the coast towards Grahamstown; en route the N10 splits from the N2, going northwards towards Middelburg and eventually Namibia. After Grahamstown the N2 passes through the former Ciskei; at King William's Town it turns back towards the coast, meeting it at East London. The N2 passes around East London on a bypass; it meets the N6 which runs northwards from East London towards Queenstown and Bloemfontein. After East London, the N2 turns again towards the interior in a northeasterly direction to avoid the difficult terrain of the Wild Coast. It passes through the former Transkei and its former capital Mthatha. Near Kokstad, KwaZulu-Natal the N2 crosses into the province of KwaZulu-Natal. At Kokstad the N2 meets the R56 from Matatiele and turns again back towards the coast. The R56 separates from the N2 at Stafford's Post, running in a northeasterly direction past Umzimkhulu, Ixopo and Richmond towards Pietermaritzburg. The N2 eventually meets the coast at Port Shepstone, and is tolled once again. The R56 can be used as a alternative to avoid the toll plaza at Port Shepstone, and one can follow the R56 to Pietermaritzburg, and then using the N3 from Pietermaritzburg to Hillcrest, where one can use the M13 as an alternative to Durban. From Port Shepstone it runs as a freeway past the resort towns of the KwaZulu-Natal South Coast, including Umzumbe, Hibberdene, Ifafa Beach, Scottburgh, Umkomaas and Amanzimtoti, before passing on a bypass around the city of Durban. At the Westville EB Cloete Interchange, the N2 meets the N3 from Johannesburg. After Durban, the N2 runs as a toll freeway passing through Umhlanga Rocks, Ballito and Tongaat. The N2 runs close to King Shaka International Airport and a tolled offramp provides access to the airport. It is tolled twice before the freeway section ends at KwaDukuza(formely Stanger), once at Tongaat and again before KwaDukuza. It then continues as a single carriageway with two lanes on both sides and passes through sugar cane plantations on the KwaZulu-Natal North Coast. It is tolled once again, and for the final time at Mtunzini and meets the R34 which provides access to Richards Bay to the east and Empangeni and Ulundi to the west. The 34 km stretch of the N2 between Mtunzini and Empangeni is being upgraded to a dual carriageway. After Richards Bay, the N2 turns north, moving away from the coast into the heart of Zululand where it runs past the town of Mkuze before running close to the border of Swaziland before passing the town of Pongola. After leaving Pongola, the N2 makes a direct line for Piet Retief and meets the R33 that links Piet Retief and Pietermaritzburg via Vryheid which is 370 kilometres away. It then heads for Ermelo where it eventually terminates at the corner of Voortrekkerlaan and De Emigratie Street. The total length of the road is 2255 kms. Heavy rains triggered a mud-slide on the Kaaiman's pass section of the N2 between George and Wilderness. This caused the road to be temporarily closed from 26 August 2006. As a result of the slide a section of roadway sagged and large cracks appeared on the road surface. After an inspection by a team of engineers a single lane was reopened on 29 August for vehicles with a gross mass of under 5000 kg. An alternative route following the Saasveld road was put into use, but this road only allows for a single lane of traffic and light vehicles. Heavy vehicles have to take an alternative route via the R62 and Langkloof pass effectively lengthening the distance from George to Wilderness from 11 km to over 600 km (news24.com story). The road has since reopened but major repairs are being done. Traffic on the N2 has also been disrupted on numerous occasions because of protests. On 10 September 2007, residents of Joe Slovo Informal Settlement blockaded the N2 Freeway in Cape Town near Langa. Police responded with rubber bullets injuring over 30 residents. On 4 December 2008, a few thousand residents of eMachambini, between KwaDukuza and Richards Bay in KZN, blockaded the N2 Freeway in protest against the proposed AmaZulu World Themepark. Police opened fire and injured about 23 residents and arrested about 10. On 20 October 2012, a section of the N2 was closed after heavy rainfall caused a collapse about 20 km outside Grahamstown. Wikimedia Commons has media related to N2 road (South Africa). ^ Falkner, John (May 2012). South African Numbered Route Description and Destination Analysis (Report). National Department of Transport. pp. 7–12. Archived from the original on 6 June 2014. Retrieved 27 January 2014. ^ "Cape Town: Police wade in on Joe Slovo shackdwellers blockade". labournet. ^ "N2 Gateway and the Joe Slovo informal settlement: the new Crossroads?". Abahlali. ^ "Cops break up protest over KZN development". Mail & Guardian.